When you’re involved with the RSPCA, they won’t let you kid yourself when your cat is getting too podgy! I’m very guilty of turning a blind eye to little Freya’s recent weight gain. At most, I’ve changed her biscuits to a diet variety and a prepared myself for a telling off from the vet when she goes for her jabs and check up in November…. That’s really not acceptable, is it? That’s putting the health of my much-beloved little Freya at risk because I’m too lazy to do anything about it! The crew came round the other evening to discuss further plans and preparations for our upcoming Crafternoon Tea event scheduled for 19th November at the Parkside Hall in Ampthill. A long “Oooooooooh….” came from both Alison and Marie. I knew immediately – as all 3 of us watched her sashay by – that, yes, Freya was larger than she should be…and I needed to fix it NOW….not wait for a telling-off in November. The extra pounds just seem to have appeared in the last few months. I can only think it’s because I’ve been enjoying a summer off work and so she’s been treated to a few more snacks as I’ve been home so much. And I now leave an extra bowl of biscuits out in the hope of encouraging Oscar to nibble on some as he doesn’t seem to eat enough. But I think biscuits are the equivalent of popcorn to Freya. Absolutely no WAY you can walk by the bowl without snaffling a few…. So the diet started that evening. I’ve lifted both big bowls of biscuits. She now gets a small handful of biscuits in the morning. If she can eke them out to last the whole day, good for her…but once that handful has gone, it’s gone for the day. Cut her king prawn treats dramatically. She still gets them, but not nearly as many. And a wet baggie in the morning and one in the evening. I put myself on a diet at the same time. If she’s cutting down, I will too. Do us both the world of good! 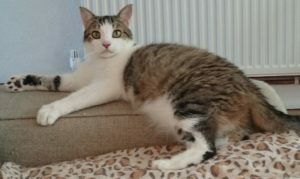 Overweight and obese cats run risks of serious health issues – including diabetes, liver problems and thyroid issues – as well as putting an extra strain on their joints, which can lead to arthritis. Letting your animal companion get fat is, effectively, you saying you think it’s OK for them to be unwell and in pain. We recently had a VERY large tom come into Branch. Sergeant Harry Tubbs weighed in at a eye popping 9.9kgs. He was incredibly handsome ….but HUGE. The stress that weight must have put on his little heart doesn’t bear thinking about. So he’s on a very strict diet, getting plenty of exercise and, good news, he’s got his forever home lined up too. Funnily enough, my little Freya is thoroughly enjoying the extra exercise she’s getting. I’ve got the old laser pointer out and she’s BONKERS about it. I give her a run around for a good half an hour each evening and she’s relishing the extra attention. If you think your pet is overweight – don’t delay. Get the extra pounds off them. If unsure about the route to take, whisk them over to your vet for a check up and some advice. Just been chasing Finlay around the front room trying to get some ‘promo’ pics of him. The fella has, simply, the COOLEST tail! He holds it curled up – a bit like a husky dog. And he does this rather endearing thing…well, he’s got a few endearing things…but, one of them is when he wraps his tail around your arm when you’re stroking him. Tail has a life of its own. 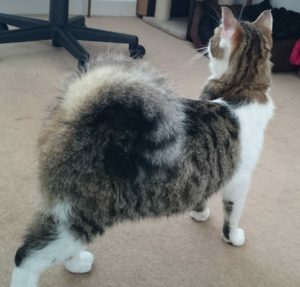 I enquired about his tail when we had him vet checked as I was concerned there might be a problem with it…but, no. It’s not broken or damaged in any way….he can straighten it and he’ll let it fall loose, which he’ll do when he’s falling asleep on my lap. He just seems to like to keep it curly! His previous circumstances were stressful for him but he’s come a long way already! Turns into a kitten – albeit a rather LARGE one – at the first sight of his feather stick or the laser pointer toy. He’ll charge about like a crazy loon and then dash over to you for a quick cuddle. Then CRAZY! Then, CUDDLE! …CRAZY! …CUDDLE! He’s been in my foster care since mid-June now. It being kitten season and summer holiday season, it’s hardly surprising we’ve had no enquiries about him. Folk are nuts about kittens and the adult cats get a bit neglected at this time. We’ve got an ‘Open Evening’ coming up on 17th Aug. Anyone interested in volunteering with us – as a branch trustee, fosterer or home visitor – is welcome to pop along and meet a few of the crew over a cuppa and some biccies (or a cheeky glass of wine)! Message us on the Facebook page if it appeals and we’ll send you the details. Also wanted send everyone who donated to Lady Lou Lou’s Fundraising appeal a HUGE THANK YOU! The good news just comes in spades….you INCREDIBLE folk raised over £500 to clear some of her substantial vet bills. AND…Lady Lou Lou is recovering nicely and has been officially signed off by the vet. She’ll need monitoring but she’s getting there. AND… AND….Lady Lou Lou went to her wonderful new home on Sunday. She’s settling in nicely and grows more beautiful by the day….a really lovely little cat. This is little Lady Loulou. 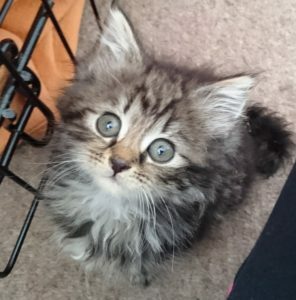 She came into our care after being found – along with two siblings – stuck between a wall and a fence. Feral, with no sign of mum anywhere, we guesstimated that she, and her little brother and sister, were around just 7 weeks old. Very, very thin. And very, very uninterested in human beings! They went straight into foster to get them socialised as quickly as possible but it was soon evident that Lady Loulou wasn’t well. She was unable to go to the loo and spent most of her time digging in the tray and straining. We separated her into a different room and put her on ‘Poo Watch’. Things didn’t improve and her back area was so swollen, it looked ready to burst. And it was oozing goo. But Lady Loulou put up with the washing and the fussing and quickly turned from disliking humans to a very affectionate, headbutty, nosebumpy little bundle of purrs. We were sure her first trip to the vet was going to be her last. We were sure her second visit was going to be her last. And the third! But, with the help of a truly magical vet and Lady Loulou’s plucky courage, she kept going despite her extreme discomfort. No one ever would enjoy having poo squeezed out of a very sore and swollen bottom. Several days later, still not much to show and the little thing had to have an enema. She was so blocked up, she had to be sedated as well. Sent home with more meds and put back on ‘Poo Watch’. Tuesday….3 poos!! She’d met the target of 2 to 3 soft poos per day on DAY ONE! Much happy dancing! Thursday….no poos. Back to anxious. Today…so far…one little poo. Nails bitten WAY past their quicks. But we’re positive. And the vet is positive. And we’re peering at Lady Loulou quite often, saying “Go for a poo, Lady Loulou!” Instead, the little fluff ball is larking about with one of her toy mice. She’s wonderfully playful! Can be a bit of a diva when back in the nursery with her siblings for some playtime. She’s got quite used to being the centre of attention! 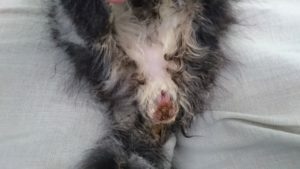 The amazing vet reckons she will need a LOT of monitoring – to keep the balance between diarrhoea and constipation and he’s got fingers crossed she’ll grow out of this in time. She was probably way too young to have lost her mum and forced to eat solids way earlier than she should have out there as a feral. She’s certainly the smaller of the three picked up that day. Although, have to say, she has a most hearty appetite! And now we’re totting up the cost of the bills and it’s quickly added up to ‘SCARY’. The enema alone was quoted at just over £300. Our fantastic vet gives us a discount – but the visits and the medication and the treatments still come at a cost. We don’t do this kind of appeal very often but we’re hoping we might be able to claw some of the costs back through donations from our supporters out there. Anything we can put into the pot for Lady Loulou will make a huge difference. Every single penny to Lady Loulou’s bills. Or, if easier, drop us a message and we’ll send our bank details. 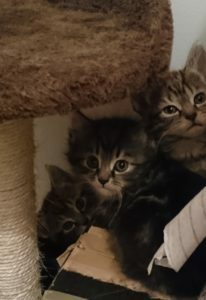 The good news is that her siblings, all being well, will be in their new homes by the end of the week. They’ve turned around quite quickly and they’re going to make wonderful animal companions. And, fingers crossed, we’ll be able to find Lady Lulu her new home in time. 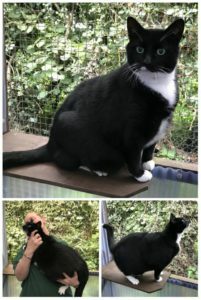 She’ll be coming with ‘history’, will probably need a patient and dedicated owner with a mild obsession about cat poo – but she has BAGS of personality and lots of love to give in return. ‘Angus me coat up, will ya? Leave a comment on ‘Angus me coat up, will ya? Pretty much every time I get a different colouring of cat through the door, they become my favourite. After Sid moved in, it was black cats. “Oh, I have SUCH a soft spot for black cats!” Then Freya arrived. 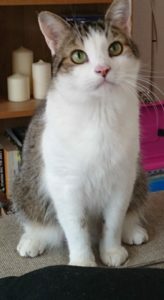 “Oh, I have a REAL soft spot for tabbies!” Soft spot got softer with the arrival of Oscar. Now, with The Girls, “Oh, I have MEGA soft spot for torties!” Continue reading ‘Angus me coat up, will ya? Leave a comment on Do you have any spare time? If so our Charity Shop in Ampthill are urgently looking for volunteers. Continue reading Do you have any spare time? Naughty torties here and there…naughty torties everywhere…! And KITTENS! Leave a comment on Naughty torties here and there…naughty torties everywhere…! And KITTENS! Belly Belle has finally popped! She went into labour late yesterday evening – on Kendall’s bed…wanting Kendall as close as possible the whole time. Continue reading Naughty torties here and there…naughty torties everywhere…! And KITTENS!